Cloud-streaming video game service OnLive started Friday with rumors swirling it was closing down for good, but now the company is denying it's going under. However, question remarks remain if mass staff layoffs, as reported in an alleged email from an OnLive employee, will happen. Several news outlets are reporting that the company is indeed laying off most of its staff. "I wanted to send a note that by the end of the day today, OnLive as an entity will no longer exist," the alleged email, sent to game developer Brian Fargo, said. "Unfortunately, my job and everyone was included. A new company will be formed and the management of the company will be in contact with you about the current initiatives in place." Fargo Tweeted the email's news, starting a storm of speculation. However, Brian Jaquet, OnLive's director of communications, responded to several news outlets, saying the company has no comment on the rumor it's shutting down other than to say, "of course not." Fargo later Tweeted he received a "recall" message for the email he received from the OnLive source. "Now what does that mean?" he said. Jaquet hasn't admitted or denied OnLive employees are being let go, either. Another source has reportedly told Kotaku the company is preparing to file for Assignment for Benefit of Creditors, a type of bankruptcy that provides protection from creditors. OnLive as it's known would cease to exist, the source allegedly reported CEO Steve Perlman told staff during an all-hands meeting Friday morning, while a "subset" of employees would be brought in under the company formed from OnLive's remnants. Gamasutra reportedly has confirmation the company is letting go of its entire workforce, adding more fuel to the firestorm growing around the Palo Alto-based company. Thought it recently forged a deal with Ouya and got a lot of buzz thanks to E3, employees are reportedly unhappy with Perlman for passing up chances to sell the company "many times," putting OnLive's future in peril. 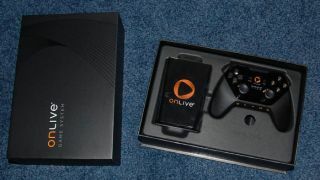 What's more, TechRadar reported in March that gaming industry expert Nicholas Lovell considered OnLive a "red herring that won't be around in five year's time." Lovell was referring to the company's streaming game market model, though trouble in the company's top echelons could be compounding its "old way" thinking. TechRadar reached out to OnLive and was told by Jane Anderson, a company spokeswoman, that, "Our policy has always been to never comment on rumors, regardless of what they are. "We have some major product announcements coming in the works...but the only news we have today is the Vizio Co Star launch." Anderson was referring to the company's delivery Friday of a "MicroConsole" with pre-loaded GoogleTV as well as the OnLive application. TechRadar will update this story if and when information becomes available. We recently reviewed the company's desktop version, and you can read the full report here.